According to Treasurer Scott Morrison, it's just one more day until the Budget. Treasurer Scott Morrison says the Budget won't be a cash splash or a "typical budget", so why is he cutting taxes for his Party's major supporters? Managing editor David Donovan says he's taking the ... err... "trickle down". "It's not a typical budget!" exclaimed Treasurer Scott Morrison, over and over again on Monday. His firstBudget is to be delivered todnight (3/5/16). "... two days away — today and tomorrow". Luckily, Treasurers don't need to be able to count. Do they? Already, we are getting a pretty fair idea about what will be its central planks. No "cash splash" this time around — at least not for low income earners. Not like the one just given to French tin can manufacturers, anyway. No, apparently it will be about "creating the economy of the 21st Century"; "kickstarting the economy", "providing an incentive for effort", "producing a growth dividend", and so on and so on and so on, blah blah blah. All these empty catchphrases really add up to is lowering taxes for well off people and big corporations. So, a sort of a cash splash. Just not one for the hoi polloi. And, of course, corporate tax will be reduced. Because if we have learnt anything recently, multinational corporations are paying way too much tax in Australia, right? I was watching Sky News yesterday and Cities Minister Angus Taylor was being interviewed by David Speers. Speers asked about whether Taylor thought the trickledown effect worked. Whether he thought cutting corporate taxes would increase wages for workers — one of the illogical arguments the Government has been using to support this move. Taylor said all the usual buzzwords (see above), but then said that the trickledown effect was "how it had always worked in Australia". Was how Australians had "always gotten ahead". This is the mantra of increasing inequality. Of further cushioning the nest of the sort of people who financially support the Liberal Party. Of course, cutting corporate taxes will not increase investment in Australia. It will not increase workers wages. What it will mostly achieve, I guess, is to increase the amount of money giant multinationals transfer out of this country into tax havens. I think most voters are savvy to all this. That increasingly inequality does no-one any good. And so it may well be there won't be a Liberal Government after 2 July. I suspect that this eventuality may be even more likely after tomorrow's atypical, bravely unfair, budget. I think it's fabulous that our Treasurer reveals on the day before his first budget that he can't figure out how many days away tomorrow is. 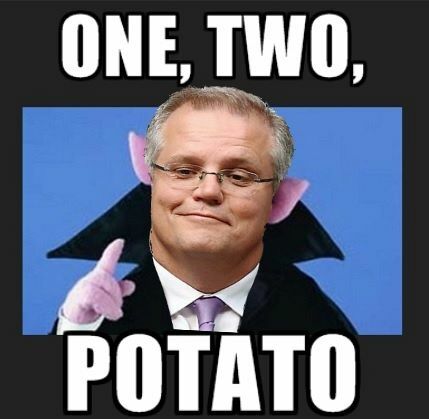 Here, @ScottMorrisonMP, a useful mnemonic to help you work out how many days away tomorrow is: https://t.co/qjiMJGqTpd You're welcome!